Are you adding a note or a person? Do you ever feel like it’s Tuesday afternoon and you’re walking into Mrs. Ineedalife’s English Lit class without the paper that was due last week? I realize this is a rather out dated metaphor for the 30-something mom set, but none the less I’m feeling like this about The Nuggets. You see I’ve been off partying instead of producing content. Ugh, that sounds so “pro blogger”. Please people this blog is called “Chicken Nuggets of Wisdom” it’s not like you’re here for my dissertation on Tolstoy, right? And if you are, see me after class. Party? Didn’t she say something about a party? Why yes, yes I did*. You see I’ve been slaving away with my Creative Cohort, Jennifer over at Hip As I Wannabe, on our latest project, Momz Share. This past Saturday we held our launch party and boy was it something. 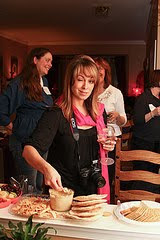 Imagine if you will, 45 women who blog about everything from kids to couture, gathered in one place with wine flowing, great food and lots of amazing door prizes and you have Momz Share. Jennifer and I really wanted to put the “social” back into social media. After all the best part of any conference is the mingle factor, right? Our very cool banner. The logo was created by 107designs. The banner was artfully put together for us by our number one sponsor Sisarina.com who is also helping us get our website up and running (love them!). Bailey of Makeover Momma (left) and Jessica of A Parent in Silver Spring (right) they are both as funny and smart as they are gorgeous! Amy is the too cute author of one of my favorite parenting blogs Teach Mama. Eggs and Mac…mmm sounds good. These two certainly are! 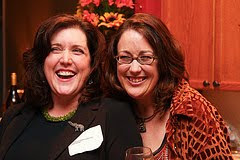 On the left is my foodie Super Hero, Christine of Gotta Break Some Eggs (who says she won’t bail me out of jail in NYC at BlogHer but I’m not buying that one). On the right we have the cure to any bad day, the illustrious Mary of Pajamas and Coffee (who will be beside ME in the poky waiting for bail). I personally believe that this last shot is Jennifer after letting it slip to Lolli, as she snapped the picture, that she’d be ending the evening at my bedside in the ER (she looks suspiciously conspiratorial doesn’t she). Yes Nuggeter’s this is where I get my “Extra Credit”. I earned it with pain, blood and 2 hours in the ER getting my toe literally glued back on. That my darlings is an entire post in itself! 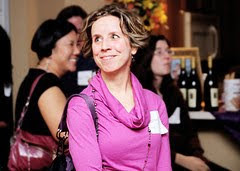 Our generous investor, Rebecca Reel. The DH and my Nugget offspring for putting up with the lack of home cooked meals and fits of stress induced insanity. And the ER staff at the Fredrick hospital for NOT amputating my foot, despite Jennifer’s coercion. If you’d like to read more about the fun there is a link up HERE. Do you live in the DC/MD/VA area? 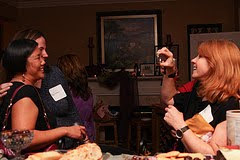 Heck even if you don’t but you’ve got like a gazillion airline miles that now you have the PERFECT excuse to use them, come join us for the next Momz Share event hosted by Jessica McFadden of A Parent in Silver Spring @jessicaAPISS on May 22nd! 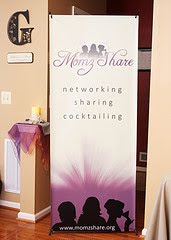 You can reach the Momz Share gang at lara.momzshare@gmail.com until we get our website up and running. This looks like ti was so much fun! I'm totally coming to the next one! You and Jen did an awesome job with Momzshare. So glad to be a part of the inaugural event! I found out about Momzshare two days before the event and was sorry my calendar was already full! I'd love to be put on the email list! It was an awesome, incredible event. I am so honored to have been in attendance. OK, that is my high-brow comment for the day. I had a blast and the convos with everyone were great! It was a great event! Thanks for putting it all together and I'm so sorry about your toe! I'm sure that is quite a story! Can't wait for the next event! What a wonderful time! Thank you! Don't you just love that picture of Jen?! It was a great evening. Thanks again for all your work on it! !